The PEAK 45 backpack is made for alpine tours. This backpack is very robust thanks to the use of the extremely tear and abrasion resistant material Nylon 420D Manstar. The broad, padded shoulder and hip straps distribute the weight of the load evenly between the shoulders and hips, ensuring a high level of wear comfort. A circumferential front zipper enables direct access to the main compartment. The PEAK 45 also scores highly with a separate safety compartment, attachment options for rope, ice axe and crampons, as well as a separate map compartment and a hip pocket. This backpack is also hydration system compatible and includes images of Alpine emergency signals. Wow. Leggero, comodo, inchiodato sulla schiena. Come non averlo. Lo schienale si asciuga in pochissimo tempo dal sudore. I recently bought this backpack who seemed to be well designed for ski touring and climbing. Several good points regarding the compartment for shovel and probe, and global design. it looks robust with a good amount of slings and possibilities. Back is comfortable even under heavy load. 2 things that are really bad designed: - ice axe carrier: 50 years ago, there was a very simple way to install axe on a backpack. efficient, simple, fast to install. why trying to re-event hot water? the ice axe carrier here is just a huge mess. no way to put ice climbing axe because the blade is too bent and just tear the bag. using clip at the bottom is also stupid idea. when it is cold and you have big gloves, well i finnaly put 2 small part of 4mm ropes to transform as old school and it works fine. i removes the clips totally useles. - the cord to lock the top of the bag is placed on the side and on the top of the extension. not a good idea when you want to put the hood inside the bag. you can not lock it. better to put the cord in the front as usual. I have not tested yet the ski carrier. i have just the impression that ski edges risk to tear the bag at the shovel place (bended surface). we will see. But far better quality than other bags i have seen on the market. and still almost a classical design which becomes very rare. I used it for a one week glacier hike in Switzerland. It's a perfect bag: comfortable, plenty of room, everything is easily accessible. You can also fix many things outside the bag (in my case: crampons, snowshoes, hiking sticks, ice axe, camera tripod). 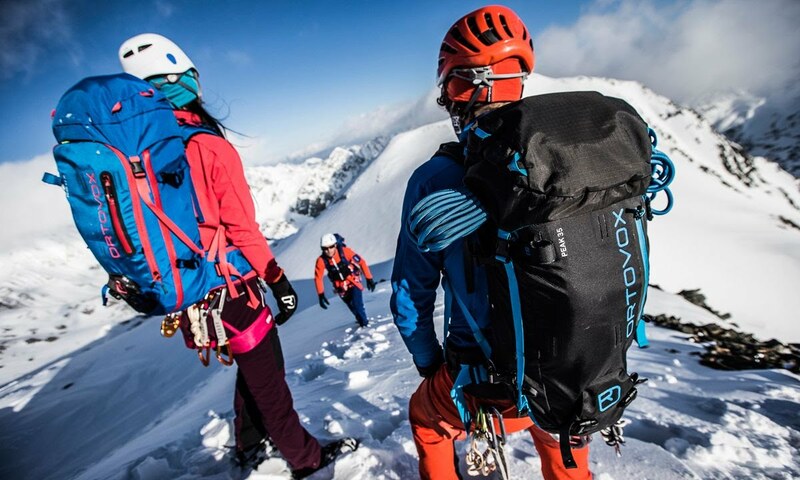 The perfect ski mountaineering pack! With a dedicated compartment for your shovel blade with sleeves for the handle and probe, it makes accessing your safety gear easy, and keeps these items separate from the rest of your stuff. The dedicated map pocket is a nice touch. The pack features dual ice axe carry, crampon straps, and a helmet carry that can be attached in 2 places, and the best part is all of these extras are easily removable for a clean pack if you don't need them. It has a top lid compartment handy for your snacks, and another sleeve inside the lid for your first aid kit. The full side zip is awesome, I can access my heavy water buried in the bottom with ease, no matter what is attached to the pack or how full it may be. The pack also has a top rope carrying strap, that can either be carried above or below the top lid. The top lid expands upward if you're carrying a full load, or can be cinched down to make it a smaller size for day tours. The side straps make an easy A frame style ski carry, or they can also cinch the pack tight for better carrying with smaller loads. The pack easily expands to fit a sleeping bag for hut tours. Also included are attachable straps to haul a snowboard if you still haven't figured out that skiing is better. There's a hip belt pocket, awesome for storing chap-stick and some candies, and on the opposite side there's a gear loop to hang some carabiners. The inside also has a hydration pack slot if you desire. The hip belt is robust and carries heavy loads well on your hips, and is easily adjustable in many ways. Honestly this pack is a home run, and there isn't a single feature missing and there's nothing extra you wouldn't need for ski mountaineering. The pack is well built and looks great. Just buy the damn thing and use it for day ski tours to overnight ski mountaineering objectives, it's so versatile! Great job by ortovox. I used this for winter climbing / mountaineering in Scotland. It's a fantastic bag: light; stable on climbs; comfortable walking in; and super-easy to access (due to the full length zip). I was also very impressed with the level of attention to detail (colour-coded quick access into the top of the main compartment, velcro tabs to hold the straps in place where there's excess length). Top marks for clever Swiss design in action. Super Rucksack dank dem swiss wool System ist der tragekomfor unvergleichlich!